Matchbook is a bit different when compared to Betfair, Betdaq or Smarkets. 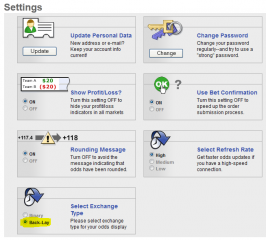 Below are som general tips to make it easier using Matchbook. 1. 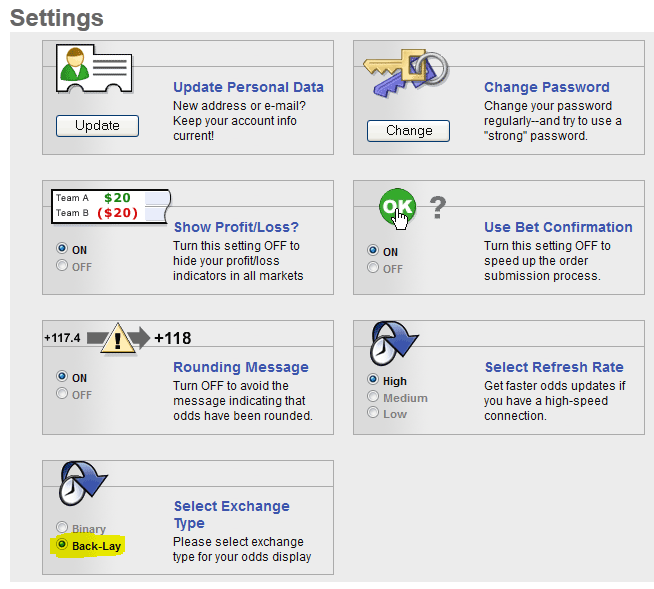 Enter your Matchbook settings and select “Back-Lay” under “Exchange Type” (highlighted in the screenshot below). Now you will see the odds in the same way as in Betfair, instead of Matchbooks “Binary” odds which can be difficult to understand. 2. Let’s say that you wish to lay (bet against) Man City. In the below screenshot you can see that the lay-odds is 3.560 (with a market depth of $2,500). Click on that odds to add the bet into your “Order Pad”. 3. “b-stake” is your “Backers stake” (the amount you wish to win). “L-stake” is your liability (what you risk to lose). For more information about lay-betting, just go to the lay-bet FAQ. Matchbook charges 1% commission on each bet you place. If you win the bet, the commission rate is 1% of the win amount. If you lose the bet, the commission is either 1% of the stake, OR 1% of the potential win amount, whichever is lower. Sometimes Matchbook runs promotions where they set commission to 0% for RebelBetting customers. If you have registered for this promotion with your Matchbook username, the comission calculation is automatically adjusted. If you HAVEN’T registered, the ROI calculation is incorrect and you need to calculate yourself manually.